Once more I court the long-neglected Muse." 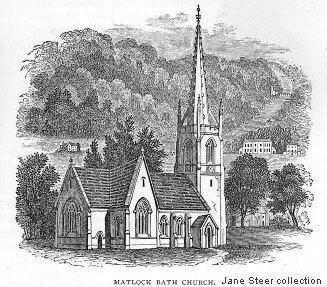 WRITER on Derbyshire scenery somewhere says, that when Nature had completed Switzerland, there was left one romantic fragment for which she had no further use in that country, so she set it in England, and it was called Matlock. The happy conceit hits off Matlock better than many pages of diffuse description. Enthusiastic people, who have never crossed the channel, compare Oban to the Bay of Naples, Grasmere to Lucerne, and Torbay to Nice; the Grand Parade at Cheltenham is to them the Unter der Linden of Berlin, and they bestow upon the Devonshire Dart and the Monmouthshire Wye the designation of "The English Rhine." It is no doubt satisfactory to our insular pride to know that we compare favourably in the matter of beautiful scenery with other countries, though it is somewhat invidious to seek to establish the excellence of the scenery of one country over that of another; but it may fairly be conceded that the comparison of the Peak district with Switzerland is not so far-fetched as such similes generally are. The Peak is Alpine on a reduced scale ; it is Switzerland seen through a lessening lens ; its hills are mountains in miniature; but it is none the less romantic, except to people whose standard of scenery is that of mere size, and who measure the beauty of an eminence by its bulk and height above the level of the sea, and to whom the charm of a river lies in its total length. There are four Matlocks-Matlock Village or Town as it is generally called is an old-world place of gray dwellings and ancient Parish Church, built centuries before the other Matlocks were dreamed of; Matlock Bath, Matlock Bank, and Matlock Bridge, all lying within the radius of a couple of miles. To Matlock Bath belongs the most scenic beauty; Matlock Bank is on the breast of a hill that overlooks the rocky valley, and is monopolized by hydropathic establishments, the largest of which is Smedley's, who introduced the "cold water cure" into the district ; while the Bridge is the little market town, with its railway station, down near the river. "The Bath would be a much more frequented than it is, if a sad stony way which leads to it, and no accommodation when you get there did not hinder." But when good roads were made, and hotels sprung up, the waters of the Bath were in great request. The " Old Bath Hotel" became an establishment of repute. Gough describes the Matlock of his day as being "much frequented by the neighbouring gentry for health and amusement, without the infection of southern manners." Here Lord Byron met Mary Chaworth, heiress of Annesley, and here the episode happened, recorded by Moore, which was destined to govern the life history of both the bard and the beauty. Byron's letters abound in illusions to the beauties of Matlock. The original Old Bath Hotel is not in existence. Near its site is erected a new building of large proportions, called the Royal Hotel. In the "Visitor's' Book" of the New Bath Hotel, Mr. Ruskin's name occurs more than once. This comfortable caravanserai is one of the institutions in a town or hotels, of which the Temple, Hodgkinsons, the Devonshire, and the Old English at Matlock Bridge, will be recalled by the readers of this page. All lovers of trees should see the as a light skiff shoots past, with a fair Undine giving a dash of picturesque colour at the helm. It is pleasant to sit in the sylvan shade in the springtime, when the trees behind are jubilant with feathered builders, and the jackdaws are calling to each other in the ivy of the crags, and the leafage is of that luminous, tender, delicate green which the scorching sun soon dims into a dingier hue. Pleasanter still, perhaps, is this retreat in the autumn time, with "the deep colour of the woods and the silence of the birds," when the beech leaves are burnished like bronze, and the sycamore covered with tints of red, and the birch splashed with yellow, and ever and anon a dying leaf falls with an audible sigh of regret at your feet. Side paths diverge from the main paths of the Lovers Walks, and climb up the Hag Tors, magnificent pieces of rock scenery, whose gray limestone turrets are trellised with clinging trees, and wild flowers, and glossy ivy, and whose rocky recesses are luxuriant with vegetation. Here and there a retiring bower, at some "coign of 'vantage," offers a rest and a panoramic prospect, embracing all that is beautiful between Masson and Harp Edge, and the view is one of the finest that you can obtain in Matlock. Far away below, the Derwent glances among the trees, as it glides on to the weir, beyond which it lends beauty to the green slopes crowned by Willersley Castle, the mansion of the Arkwrights, first becoming useful at Cromford, "the cradle of the cotton manufacture," where are the mills founded by Sir Richard Arkwright, the Preston barber's apprentice. exertion, however, is rewarded by the panorama, which is a feast to the eye accustomed even to the grandeur of the views from more lofty altitudes. The Prospect tower hangs over an Avernus-like descent of woodland scenery. Away below is the curve of the Matlock valley, a deep ravine, on one side of which rises the mountain slopes of Masson, and on the other, tall, fantastic crags, draped with green, stretching from Scarthin Nick, past Hag Tors, to the impending precipice of High Tor, which seems less startling and stupendous when viewed from this standpoint, as the Riber hill-side, crowned with the towers of Riber Castle, rises to a greater height immediately behind it.